A couple of years ago, Sean Charlesworth created this incredible sculpture of an octopus cyborg as a thesis for his degree in 3D modeling and animation. It's just one of many 3D-printed creations that remind us how much this new technology could change the way we make art — as well as everything else. This cyborg doubles as a submersible, and you can see some living quarters for its crew inside. The design was printed out from several materials, on a special 3D printer that works with multiple materials to make fabrication easier for projects like this. 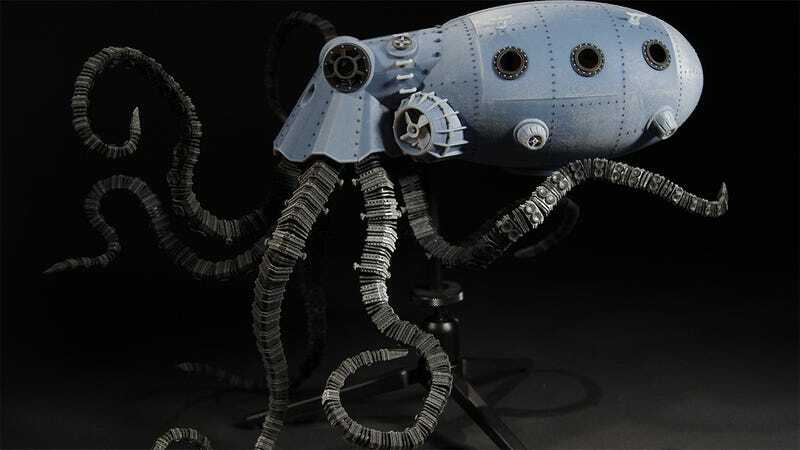 Named "Octopod Underwater Salvage V", the model was designed in CINEMA 4D Studio and different materials, types and colours were assigned to each part. The digital models were printed at the New York University Advance Media Studio on an Objet Connex500 3D Printer. The Objet Connex500 is Objet's pioneering multi-material 3D printer featuring a large build tray size of 500 x 400 x 200mm and can print from a range of 107 different materials, with up to 14 different materials in a single part. You can see more of Charlesworth's work on his website.